Hi, I’m Kee Man. No, I am not the blogger of the month. But Let me tell you what happened last weekend. Cyril called me up early in the morning. He gave me a task and being in the state of half-conscious, I agreed. I jotted down his request on my notepad, then rushed for a shower. After that, I looked back at the note on my table and I was stunned! WHAT??! A guardian? What did Cyril mean? I immediately tried to call him back for clarification, but he could not be reached. The Digi operator went like “Tut…tut….nombor yang kitak dial sik dapat connect lah kinek tok…mun sik dapat tunggu, tukar Maxis jak.” What!! Not at this hour! I tried to calm down and look back at the note. Guardian? The following image came straight into my mind. Something must be all wrong. Guardian must be a code of some sort. Out of the blue, I over-heard the song “Your Guardian Angel” played by my devoted neighbour. Yes! It must be related to angel! But why do we need an angel for Sarawak Bloggers? And how on earth am I going to find one? Feeling hopeless, I turned to Google, the king of searches. So I typed in “Angel for Sarawak Bloggers” and a whole list of links appeared! However, the third link caught my attention immediately. Me : Cyril! I have found the person you wanted me to find! She’s Perpetua Angeline! Cyril : Good. What have you found out about her? Me : Well, based on her blog http://angel-cupid.blogspot.com/, I can say she loves chocolates, red wine and photography. And she really likes red! Cyril : Nah! Amiey would kill me! Ok, you have done a good job searching. 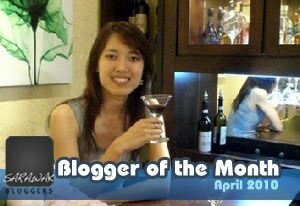 Now make her the Blogger of the Month for April! Me : Oh! This task is because of that? Cyril : Yes, of course! I thought you knew. Me : Then why did you say you need a guardian for Sarawak Bloggers? Me : You didn’t? Then who the hell called me just now? Cyril : I don’t know! I didn’t call you this morning. Suddenly, I saw a red figure dashed out of my house! I rushed out and couldn’t believe what I saw! The Red Maxis Man?? Oh My God! I got pwned!